Stanley Getz was born on the 2nd February 1927 in Philadelphia, Pa. He first learned to play bass, then bassoon before taking up saxophone. At 16 he was playing with Jack Teagarden. A year later he joined the Stan Kenton band then worked briefly with Jimmy Dorsey and Benny Goodman. In 1947 he moved to California and joined the new Woody Herman band in rehearsal and remained until early 1949. Getz, Zoot Sims, Serge Chaloff, Herbie Steward (later Al Cohn) comprised the celebrated “Four Brothers” in the tune of that name recorded by Herman that gave the band its identifying sound. Getz rose to prominence with Herman’s Early Autumn. Later he led a quartet with Al Haig on piano. In 1951 he toured Scandinavia. In 1952 he did NBC studio work in New York but soon returned to leading his group, usually a quintet. While on a visit to Stockholm in the autumn of 1955, Getz was taken seriously ill and for the next six months he did not work, recuperating in Scandinavia and Africa. On his return to the US, he resumed touring night clubs with a quartet, He was featured in the motion picture, The Benny Goodman story 1956. Then he toured with Jazz at the Philharmonic in the autumn of 1957 and spring in 1958. During this time he also appeared at jazz clubs and in concert with his own groups and as a single, having settled in Stockholm. Getz worked regularly in Scandinavia, sometimes with Big Bands from Radio Stations as well as appearing in clubs and concerts throughout Europe generally leading a Quartet with local musicians. The year 1960 saw Stan making sessions for Norman Granz’ Verve label in Baden Baden, Copenhagen and Stockholm. 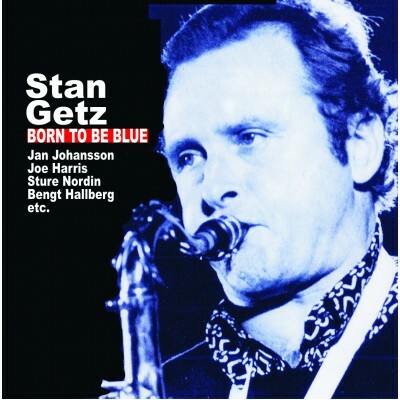 Born To Be Blue - portrays Getz, at his lyrical best in the classic Quartet context playing with three different rhythm sections in three different countries in Spring and Autumn of the same year - 1960. He was one of the great interpreters of ballad material, a sound style-setter in the post-bop “cool” era. He was a master craftsman and a true original, who has left his indelible mark on the pages of jazz history.